A 1 day gorilla tour to Rwanda’s Volcanoes national park is still possible to depart from Kigali same day and back to Kigali although Volcanoes national park deserves more than just 1 day visit with so much attractions to offers visitors to the Land of a Thousand Hills. 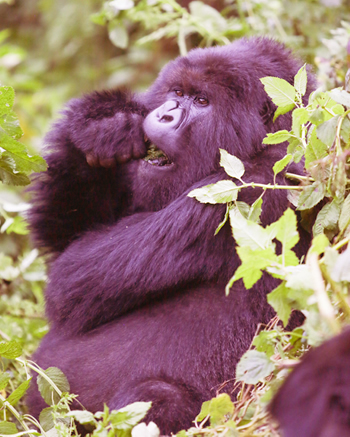 The park is home to 10 habituated gorilla families. Gorilla tracking starts at 07:30am with a briefing at kinigi visitor center. For on 1 day to arrive at the park on time, you must depart Kigali early morning at 04:00 AM and then you drive for 2 hours a journey that brings you to volcanoes national park. When you reach Volcanoes national park, you will enjoy a local traditional dance entertainment and a cup of Rwanda coffee and thereafter get briefed on the gorilla families. The guides will tell you that the time to search for gorillas can take anywhere from 3 hours to 8 hours depending on where gorillas will be found feeding in the forest. You are assured that no matter the hours it takes, gorillas are finally located and you are allowed to spend 1 hour taking photos and observing their lifestyles. Then you will return to kinigi to meet your guide and drive back to Kigali to end your 1 day gorilla tour.